Walt Disney World teases fire-breathing, flying dragons for New Fantasyland under the name "Believe in Fantasy"
Walt Disney World has launched a viral campaign hinting at flying dragons coming to New Fantasyland at the Magic Kingdom. On a new Tumblr blog and series of videos, Disney’s social media managing editor Gary Buchanan expresses his love for dragons – and begins telling a mysterious tale of “strange sightings,” “weird noises,” and “flames” coming from New Fantasyland. 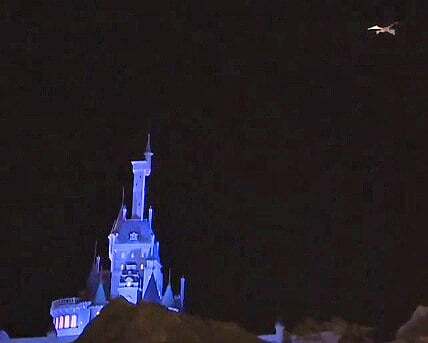 I just wanted to let you guys know that the dragon was circling over Magic Kingdom last night. I went out at about 2:45 specifically to see if I could find it. As I approached the tunnel on World Drive before Contemporary, there it was circling around the back of Magic Kingdom. However, this time, instead of flying quickly, it was actually just elegantly gliding around at a pretty slow speed. I decided to try to get as close as I could. At this point, though, there were security trucks stationed at multiple points from Contemporary back to the Monorail barn. I pulled over next to one and got out to watch. The security guard told me he wouldn’t make me leave as long as I did not try to take any pictures or video. If I did that, he said he would have to make me leave. There were some OC Sheriffs up the road, so I decided he wasn’t joking. 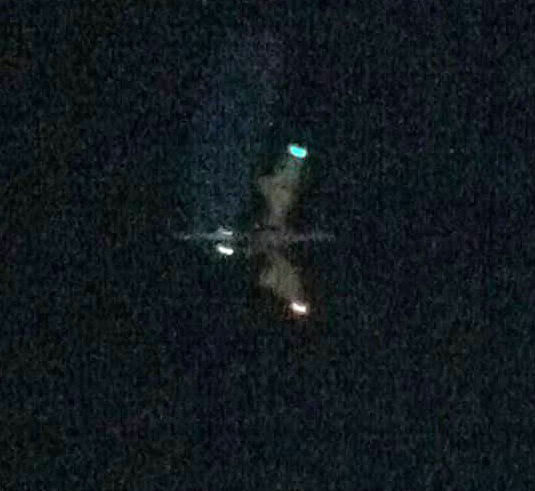 The whole time the dragon was flying around above MK, it was being illuminated from the ground by a spotlight of some sort. It give it kind of an eery glow that would seem to me as something done on purpose. With the spotlight on, it was impossible to make out the parachute attached to the top of the dragon. This made me wonder if the dragon is possibly only intended to fly at night, in order to mask the system by which it is flying. After a couple minutes of watching the dragon, the most incredible thing happened. It started flapping its’ wings!! I knew about the rumors that it flapped its’ wings and breathed fire, but I assumed it was just speculation. The way its’ wings flapped was very elegant and fluid, just like any dragon you may have seen flying in movie’s, etc. Watching it glide around gracefully combined with the fluid flapping of the wings and the light from underneath made it look like one of the most amazing things I have seen in my life. The realism was much more astonishing than I could have ever expected it to be. WDI has really outdone themselves with this thing and I am truly amazed at how brilliant it is. UPDATE (12/2/12): The “dragon” has been spotted being tested in the Magic Kingdom area in preparation for the New Fantasyland grand opening. 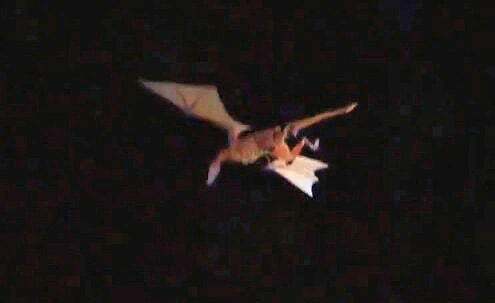 YouTube user PopSong1 has uploaded a video that barely shows a pair of lights flying through the sky, but more prominently features the loud sound of the ultralight vehicle’s engine, the basis for this dragon. At the time, many speculated this dragon would be used for the upcoming Avatar land for Disney’s Animal Kingdom, but now it seems the fire-breathing dragon will fly over New Fantasyland, perhaps in a show called “Believe in Fantasy.” Or it could just be used for the Magic Kingdom expansion’s grand opening and never seen again. It’s also noted that 2012 is the Chinese Year of the Dragon. Disney asks curious fans to follow along on the Tumblr blog at disneydragons.tumblr.com and use hashtag #BelieveInFantasy on Twitter to report any dragon sightings. With the official opening of New Fantasyland on December 6, it seems those sightings may not be far away. It is amazing the magic that the Disney Parks can create. On paper this idea seems crazy, but it shows what can be done! I actually wish this dragon wasn’t leaked earlier in the year. It would have been such an awesome surprise to see this first announced in action. Finally something original!!! I thought that Disney World was getting a bit lazy by just putting already known characters into New Fantasyland. But THIS IS GONNA BE GOOD!!!!!! This is great news, perhaps realizing they made a mistake Disney will allow the fire breathing dragon to burn down the Starbucks planned to open at the Magic Kingdom and elsewhere in the “World”. I think it’s sad how much weird hatred is directed at the Starbucks. How about hopping into a time machine and chastising Walt Disney for partnering with Frito Lay, Coca-Cola, Kodak, etc. ? If Starbucks was around when Disneyland was about to open you better believe Walt would have had them as the coffee shops in the park from Day One. Or General Motors, or GE, or Ford for the Worlds Fair, or Dole for the famous Dole Whips that everyone loves, or HP, or Nestle…Disney has always been corporate and always been changing. I don’t see the big deal with Starbucks. How about bringing back the Adventurer’s Club? Think with all the fuss over Marvel and now Star Wars, we might finally take a second appreciation of You-Know-Who’s shelf life. I’m not getting to excited. Like the awesome looking mupets mobile lab and the walking dino we will probably see this a few times before it’s send off to a warehouse to gather dust. So it’s all a Fake! It would be great if the dragon could be powered by an electric (or other more quiet) motor. The buzz saw sound is not the greatest. Hey NASA, how bout lending Disney a power cell or two? Installation takes only five minutes and it is a snap to do.